Every night before going to sleep, my baby sister Chelsea asks me the same thing. ‘Aren’t you tired yet of that story Chelsea?’ I sigh in mock disbelief, I am secretly thrilled she still likes to hear it. ‘Noooo. I love that story. It helps me go to sleep and to feel safe,’ she says, her big brown eyes looking at me through her long dark lashes. ‘I promise, I promise.’ Chelsea bounces up and down excitedly on the edge of her bed. ‘Settle down young miss, lie on your bed and curl up nice and small,’ I say in my best big-sister voice. Chelsea hops into her bed, puts her head on the pillow and tucks her long legs up beneath her. I settle on to the bed next to Chelsea and reach out so my paw is resting on hers. The story of ‘Rupert the Brave’ has been passed down through the generations and has become legendry amongst our greyhound friends. I never tire of telling the story to Chelsea and hope one day she will tell it to her children, and so on. ‘Once upon a time, a long time ago, when your great, great grandmother was a girl, greyhounds were forced to race around a track. Some of them had to chase terrified possums or rabbits and even cute piglets who were tied to a lure, squealing for mercy. Even back then, greyhounds were gentle creatures and didn’t want to hurt the poor little animals. They didn’t want to run for money either. But if they didn’t win, they were treated badly by their keepers. They were given poor food, little shelter and only had concrete floors for a bed. There was no time for fun or long walks in the park. Some got bad injuries and were left maimed and untreated. Some were taken out to the bush and shot, with their ears cut off, their identities stolen forever.’ I pause for a moment to let Chelsea wrinkle her nose and shudder at the horror, as she always did. ‘But others were much luckier and were rescued by kindly folk who found them lovely homes. They were allowed to meet with their friends, go on long walks together and sleep on warm soft beds inside nice houses’. Chelsea smiles, glad she has only ever known kindness, compassion and love. 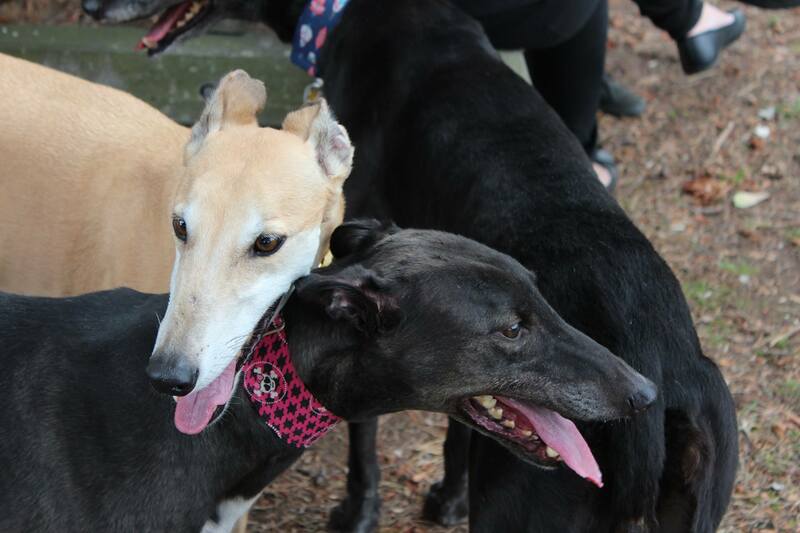 ‘One day, early in summer, a group of rescued greyhounds met at the park for a walk. As each one arrived, they gave the customary greeting; a wag of the tail, a sniff of the bottom and a little kiss on the muzzle. Jeffery was the only male in the group that day. He was a big fair haired boy with kind eyes. Jeffery liked everyone and everyone liked Jeffery. 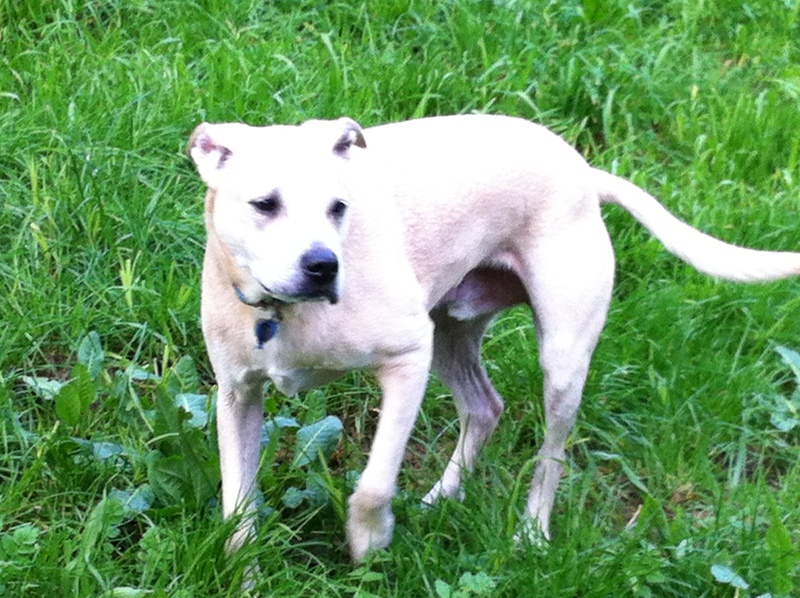 The big scar on his back leg was evidence that his life had not always been as happy as it was on that day though. He didn’t like to talk much about what had happened to him, but he was not one to hold grudges and was a fine example to the newer members of the group of how to remain dignified despite a difficult past. Jeffery shared his home with Molly and sometimes he gave her snippets about his racing days. She was normally a shy girl but knowing a little of what he’d been through she was protective of Jeffery, and thought of him as her big, gentle older brother. She was petite and pretty with dark hair and dainty white feet. Molly had been in some races too, but she didn’t like it, and she didn’t like having to share her food and her racing kennel with anyone else. 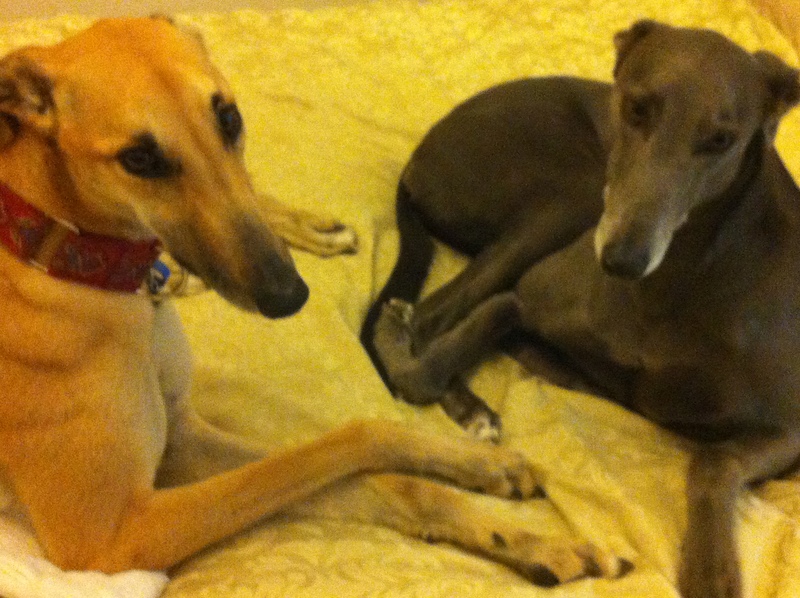 Now that she was safe, Jeffery was teaching her to be tolerant and kind to other greyhounds. She liked everyone else in the group well enough once she got to know them, but was still wary of strangers. Lady was a gorgeous, quiet girl with blue hair and enquiring amber eyes. She had been too small to race fast enough so was given up by her owner, to whom she was of no use, to a rescue group. She now lived in a lovely, safe warm home. She had fallen for Jeffery the moment she met him on her first group walk. He returned her affection in a way that made her feel special, but she noticed he was careful not to exclude the other ladies either. ‘Thank you, that would be most pleasant Jeffery’ she said, blushing profusely. Casey was the senior of the group. She had been dark haired in her youth but was now greying around her long muzzle and her flanks. Her eyes were kind but becoming hazy with age. Casey had raced many years ago; almost too ago long for her to remember the bad things that happened. All she knew was cold water made her nervous, but she wasn’t sure why. ‘Okay, ladies, I think we’re ready. Don’t get too far apart and we can have a lovely time today,’ said Jeffery as he moved majestically towards the path. ‘Before the group had walked very far, a strange looking dog appeared, almost as though from nowhere. To the tall, lean, elegant greyhounds, he looked quite odd. He had short legs, a stout body and a very short nose. His hair was blonde and coarse and his head was square. ‘Who are you?’ asked Jeffery suspiciously, the girls lining up behind him. ‘My name is Rupert.’ His was voice loud and gruff, which startled the group. Molly looked at him and scoffed. How would this short, stout, ugly dog protect them? They were large and fast and could outrun anything. ‘We don’t need your protection thank you Rupert. You can join us though, but if you upset any of the ladies, I’ll make sure you are banished from this park’ Jeffery growled. ‘Can’t say fairer than that. Let’s go then,’ called Rupert cheerily over his shoulder. Jeffery and Lady walked together, brushing shoulders occasionally. Molly sulked close by, unhappy Jeffery had let Rupert join them and spoil their walk. She didn’t like the look of him and wanted him to go away. Casey walked quietly not far behind. They all ambled slowly along the walking track, stopping to sniff bushes and trees along the way. The creek meandered beside them, bubbling over rocks and around fallen branches. Rupert stayed just ahead of the pack but every now and then he would dart back to make sure no-one was left behind. He slowed his pace to fall in beside Molly to make sure she was alright. He could sense her dislike of him, and had experienced this kind of discrimination before. He couldn’t help the way he looked. It wasn’t his fault that people were suspicious and frightened of him when they met him, even before they knew him. He was an easy-going chap, but sometimes others wouldn’t even give him a chance to prove it. He was determined to show the greyhounds, especially Molly, that he was not a threat to her, and that he was in fact quite nice. ‘Is everyone else okay?’ chirped Rupert. ‘Yes were fine, thanks’ said Casey. ‘We may walk slowly but we are happy to keep going’. ‘I’ve got an idea . There’s a good place up ahead where it’s safe for us all to have a run and a play. Who’s ready?’ Rupert asked enthusiastically, already bounding ahead. ‘We are.’ With Jeffery by her side Lady was feeling quietly confident. Rupert led the group up a hill to a hole in the fence. He ran through easily on his short legs, but he was startled to see the greyhounds had to get on their knees to crawl through. How funny, he mused. He thought of them as such elegant, graceful creatures but now they just looked plain silly; their long legs stretched out in front and their backs crouched down in a sphinx-like pose. One by one they squeezed through and when they topped the hill, there was open space as far as they could see. ‘Come on everyone, go crazy. Run. Just run for the fun of it.’ called Rupert as he darted from here to there and back again. Greyhounds had not always been allowed to run just for the fun of it. They had been made to run on a track and chase lures and be jeered at. They had to run further and faster than they were able. Sometimes they collapsed with exhaustion at the end of the race and even after they had given it their all, they were told they were useless and good for nothing. But now, after many years of campaigning to close down the repugnant industry, greyhounds were finally free to run and run and do zoomies and spins, just because they wanted to. Jeffery, Lady, Molly and even old Casey had a wonderful time playing in the sunshine. But after ten minutes, everyone was pooped and had to lie down to rest for a while. Rupert’s enthusiasm was contagious, and although the greyhounds were feeling tired, they followed his lead and headed towards the creek. At the bottom of the hill, there was a crossing made of large rocks that had been placed across the creek. Rupert bounded ahead, very sure of his footing, and waited on the opposite bank. ‘You did very well Molly. Now please tell the others to come too’. ‘Come on girls. It’s okay, even a bit fun.’ Molly called out across the creek. She was enjoying herself immensely and was surprised at how nice a non-greyhound could actually be. Perhaps she had been too quick to judge him. Lady came next and reached the other side easily, even stopping for a drink of the cool, clean water half way across. Casey was more reluctant. ‘I don’t think I can do it Jeffery’ she said, embarrassed. ‘I’m too old to learn new tricks and I’m scared I might slip into the cold water’. ‘It’s okay Casey, I’ll follow right behind you, and I won’t let you fall’ he said, nudging her gently. Rupert, ever the optimist, encouraged Molly and Lady to give Casey some support. ‘Ladies, let’s make Casey laugh and forget her fears’. ‘Come on Casey, come on, come on, come on Casey come on!’ he led them in song. Despite her apprehension, Casey couldn’t help herself and barked out loud. ‘Thanks everyone.’ Casey smiled to herself, realising she must have finally overcome her fear of water. On the way back to where their walk started, there was green, lush grass under big shady gum trees. They had another lie down, a roll on their backs and a frolick. ‘The sun is now high in the sky and we’ll start to get burnt. I think we should go home now; it’s time for our mid-day nap anyway.’ Jeffery took charge as usual. ‘I know a place where we can have a drink and cool our feet on the way back.’ Rupert seemed blessed with boundless energy. His eyes were bright and his little legs had to go at double speed to keep up with the long strides of the greyhounds but he didn’t show any signs of tiring. They rounded a bend and before them was a beautiful sight. There was a big swimming hole and the creek spilled gently over at one end, creating a little waterfall. Large gum trees flanked the banks of the creek and their rugged boughs stretched out, dappled shade providing protection from the hot sun. A huge flat rock bordered the water and allowed the greyhounds to stand comfortably to drink and to paddle to cool their tired feet. ‘It’s my pleasure to show it to you, Molly. It’s one of my favourite places to rest and paddle and I’m glad you like it too.’ It seems he was finally winning her over. Rupert went for a wander and a sniff further down the creek where he knew some of his other friends had been earlier in the day, and checked his wee-mails. The greyhounds replenished themselves with the clear water and stood quietly for a few moments. Without warning, their peace was shattered. A small, angry, fluffy, dog, full of self-importance came hurtling over the creek bank and ran straight into the middle of the greyhounds. He yapped and yipped so loudly and fiercely nobody could understand a word he said. His voice was loud and squeaky but he sounded angry. He darted from here to there, nipping at heels and jumping at faces. Nobody knew what to do. They were not used to being attacked by other dogs. Jeffery, usually calm and composed, was terrified that Molly and the other ladies would be seriously hurt. He wanted to help, but he didn’t like confrontation and didn’t know what to do. He stood rooted to the spot, himself frightened of the crazy rampaging fluffy dog in their midst. He remained standing still, his tail between his legs, embarrassed by his incompetence. ‘Help. Help. Rupert where are you? Please help us,’ Lady called out desperately. Rupert was busy sniffing in the bushes, exploring new scents. He was vaguely aware of a kerfuffle going on back at the creek, but assumed Jeffery, as their leader, would be able to deal with it. But on hearing his name, Rupert jerked his head up high, cocked an ear to the sky and immediately knew what he had to do. ‘I’m coming.’ Rupert charged out of the bushes like a mad man, his tail held high, his chest puffed out in front of him, and his square head looking formidable, ears pricked forward showing he meant business. He ran full pelt at the angry little dog, shouting at him with words the gentle, gracious greyhounds had not heard before. The plucky little dog saw him coming and for a moment contemplated tackling him head on; but quickly had second thoughts when taking in Rupert’s strong jaw line and deep, menacing eyes. He took one last nip at the shuffling, nervous feet of the greyhounds and then high-tailed it up the bank, Rupert in full-flight only metres away. The little dog was nimble and sure footed, but his strength was no match for the stocky and powerful legs that propelled Rupert. Rupert was on his tail in a few paces; there was no need for violence; harsh words and threats were all that was required, and the little dog was no longer so self-assured. Frightened and intimidated, he ran for his life. ‘Go away and stay away. You’re not welcome here if you’re going to be nasty to these lovely dogs.’ Rupert continued to follow the yappy dog, angry and threatening. He knew it would not come back. He stopped and watched for a while longer until it was out of sight. 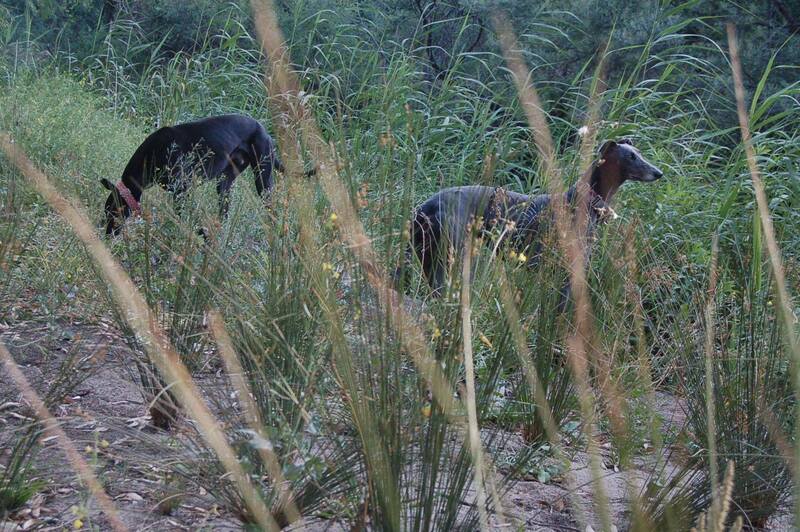 He returned to the creek bank and stood at the top, looking down at the huddle of greyhounds, still unable to move. ‘It’s okay, he’s gone and won’t be coming back. You’re all safe now. Is anyone hurt?’ he called down. ‘My foot is sore.’ Molly held her hind leg up for effect. ‘But I’ll be okay. Thanks to you.’ Molly bowed her head, glad to she had given this larrikin a chance to be her friend. ‘Thank you Rupert. You were so brave.’ Lady sidled up to him and gave him a peck on his cheek. ‘Oh Rupert, thank you. I was afraid the little dog would pick on me next as I’m old. But you made sure I was safe.’ Casey kissed him gently on his short muzzle. “It would be my pleasure.” Rupert puffed out his chest, ran around the group, giving each greyhound a friendly lick on the nose. “I will make sure greyhounds are free to run without fear whenever they want,” he vowed. 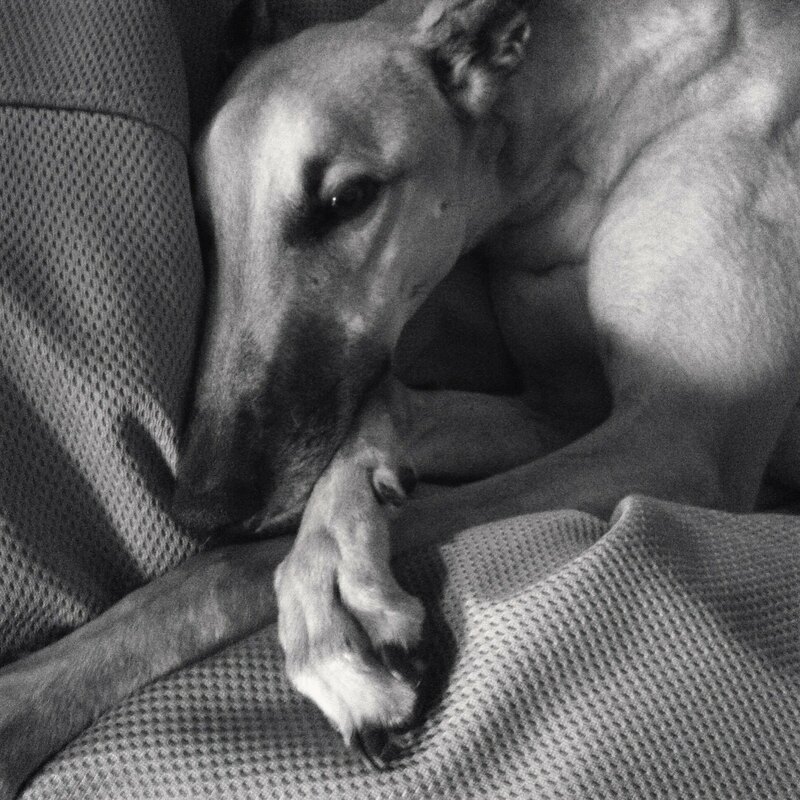 And so the legend began – ‘Rupert the Brave, Protector of the Greyhounds’. I looked at Chelsea. She had tucked her nose under her paw, a smile on her long lips. Her eyelids fluttered gently. I knew she was already having sweet dreams; looking forward to the time she’d be old enough to have an adventure like Jeffery, Molly, Lady and Casey. And of the plucky little fellow who would keep her safe. ‘Good night baby girl, sleep tight.’ I brushed my lips across her forehead and lay down beside her. We surely are the lucky ones. Categories: General, Short Stories, Welfare Campaigns | Tags: dogs, Greyhound Rescue, Happy Dogs, love, Summer, sunshine | Permalink. My name is Kylie and I am passionate about animals and their welfare. My husband and I live in Bendigo, Australia and live with our three dogs - Rupie, Billie and Chelsea - all rescue dogs. I enjoy writing and aim to share health and welfare issues and updates as well as some short stories. Thanks Meara, it makes is a little more real, doesn’t it when you know the dogs. I hope Casey approved!